Kim, J.Y., et al. A typical Manifestation of Multiple Cerebral Infarctions in Tuberculous Meningitis on Vessel Wall Imaging (2016) Int J Neurol Brain Disord 3(1): 1-3. © 2016 Kim, J.Y. This is an Open access article distributed under the terms of Creative Commons Attribution 4.0 International License. 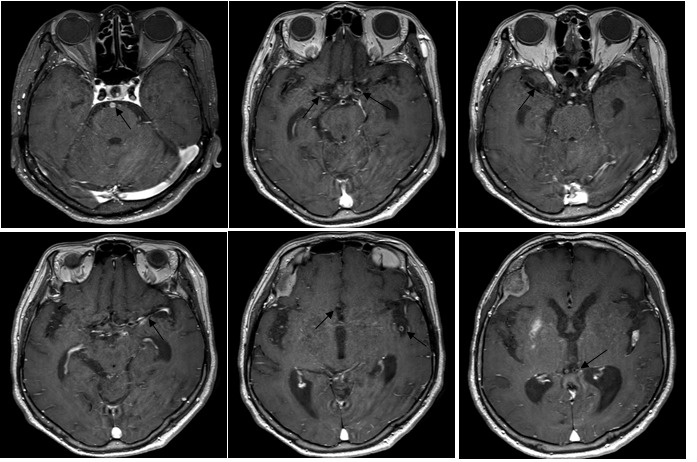 Although the most cerebral infarcts in Tuberculous Meningitis (TBM) are due to vasculitis, the pathogenesis of vasculitis remains poorly understood and the imaging signs may be direct or indirect. We experienced a case of multiple cerebral infarctions in TBM showing segmental vessel wall thickening with enhancement of large vessels and concentric wall thickening with lumen narrowing leading to vessel compression on vessel wall imaging[1,2]. Tuberculousvasculitis has long been recognized as a reason for cerebral infarctions associated with TBM. However, there is little convincing evidence for a causal relation between a specific vessel lesion and cerebral infarction. We reported an atypical manifestation of multiple cerebral infarctions in TBM on vessel wall Magnetic Resonance Imaging (MRI). A 77 year old female patient, who has no previous tuberculosis history presented with headache, fever and vomiting. The signs of meningeal irritation were presented. We supposed that she had meningitis, and lumbar puncture was performed. Cerebrospinal Fluid (CSF) study revealed cell count of 57/mm, 45% lymphocytes and 51% of neutrophils, protein of 92.7 mg/dL, glucose of 36 mg/dL, and positive Polymerase Chain Reaction (PCR) for acid fast bacilli. Brain MRI & contrast-enhanced magnetic resonance angiography (CE MRA) showed diffuse leptomeningeal enhancement along the pia matter of cerebellar and cerebral hemispheres, incidental well defined extra-axial enhancing masses in right frontal cerebral convexity (Figure 1A), and no remarkable findings on MRA (Figure 1B). Ultimately anti tuberculosis agents (oral isoniazid 400 mg/day, rifampin 600 mg/day, ethambutol 900 mg/day, and pyrazinamide (1,000 mg/day) were commenced under the impression of TBM, and her symptoms improved and she was discharged. Figure 1A: Initial brain MRI & CE MRA findings. T1 CE weighted image showed diffuse leptomeningeal enhancement along the pia matter of cerebellar and cerebral hemispheres (arrows) and an incidental finding of enhanced meningioma in right frontal cerebral convexity. Figure 1B: MRA observed no remarkable finding. During outpatient care, sudden left hemiparesis and drowsy mental change developed 8 months after antituberculosis treatment. Diffusion weighted image revealed acute right basal ganglia infarction and asymptomatic subacute multifocal left frontal, temporal, and occipital white matters infarctions (Figure 2A). Subsequent CE MRA presented left MCA (M2 insular segment) stenosis by compression with left sylvian cisternal nodule, although right MCA presented normal (Figure 2B). We prescribed intravenous dexamethasone (20 mg per day for one week followed by tapering 5mg per each week) in combination with four antituberculousregimens. Vessel wall brain MRI CE 1 month after cerebral infarction occurred revealed segmental vessel wall thickening and diffuse enhancement in bilateral anterior cerebral arteries (ACAs), MCAs, Posterior Cerebral Arteries (PCAs), and the Basilar Artery (BA), which were suggestive of vasculitis, andunusual segmental concentric vessel wall thickening with lumen narrowing at the adjacent left M2 and M3 junction (Figure 3). We hypothesized that multiple cerebral infarctions were caused by cerebral vasculitis along the bilateral ACAs, MCAs, PCAs, and BA territories and that left M2 compression was due to focal inflammatory nodule of the vessel wall. As the treatment continued, her mental function gradually improved and finally normalized, however, her left hemiparesis persisted. 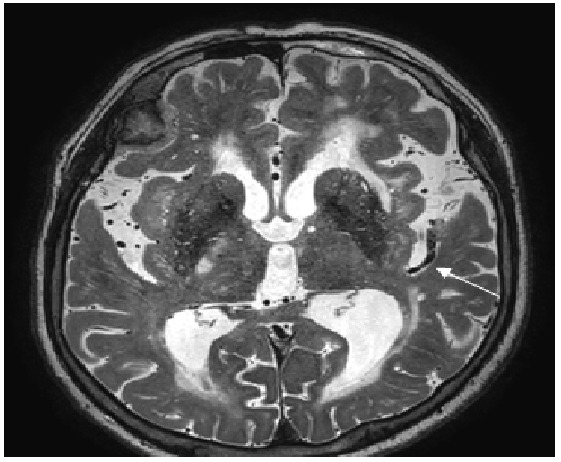 Figure 2A: Diffusion weighted image and CE MRA findings after left hemiparesis development. B1000 images with ADC map revealed acute infarct lesion in right basal ganglia (red arrow) and asymptomatic subacute left frontal, temporal & occipital lobe white matters (yellow arrows). Figure 2B: CE MRA presented left M2 stenosis (blue arrows) by compression with left sylvian cisternal nodule (purple arrow), whereas normal right MCA flow. 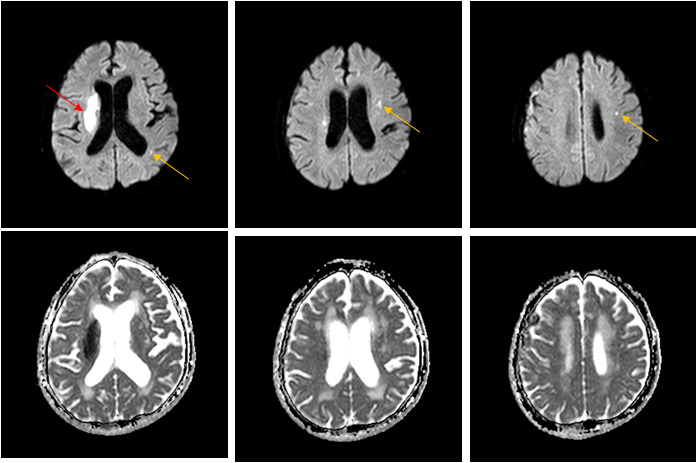 Figure 3A: Vessel wall brain MRI CE findings 1 month after cerebral infarction occurred. T1 CE weighted image revealed segmental vessel wall thickening and diffuse enhancement in bilateral ACAs, MCAs, PCAs & BA (dark arrows). and segmental concentric vessel wall thickening with lumen narrowing’s at the adjacent left M2 and M3 junction (white arrow). Figure 3B: T2 weighted image showed segmental concentric vessel wall thickening with lumen narrowing at the adjacent left M2 and M3 junction (white arrow). Ischemic stroke is not an uncommon complication in patients with TBM, occurring in 20-30%[3,4]. Cerebral infarctions can be presented as either symptomatic or asymptomatic signs. TBM with infarcts is reported to have fatal complications up to three times more often than in those without infarcts. It is widely believed that cerebral infarctions in TBM are attributed to vasculitis and/or subsequent intimal proliferation, which is considered to be a response to direct implantation of tubercle bacilli from the blood stream[6,7]. The most affected vessels are on the basis of the brain and in the sylvian fissures, where the exudates is most abundant. Exudative basal meningitis leads to strangulation, vasospasm, constriction, and periarteritis with secondary thrombosis and occlusion, which finally change arterial blood flow and result in infarction[1,5]. The locations called “tubercular zone” in the brain are mainly composed of internal capsule and basal ganglia bathed in basal edudates[3,8]. The CSF has poor defense against the tubercle bacillus owing to a shortage of polymorphonucleocytes, and rapid spreading of tubercle bacillus along with meninges and traversing blood vessels cause advanced leptomeningeal changes over the cerebral convexities and vasculitis especially in severe or late-stage TBM. Cell-mediated immunity leads to the development of a dense exudates, and necrotizing lesions in the cerebral vessels may evolve as the longer the duration of TBM. Paradoxical vascular aggravation can develop even after treatment with adequate antituberculous drugs, which may be related to immune response of the host[1,10]. 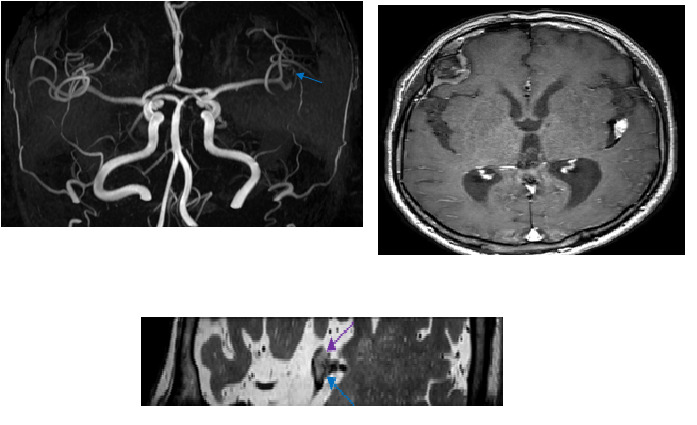 However, our immune competent patient showed multiple cerebral infarctions due to vasculitis involving large vessel territories and unusual segmental inflammatory nodule despite prompt antituberculous medication and dexamethasone[1,2]. 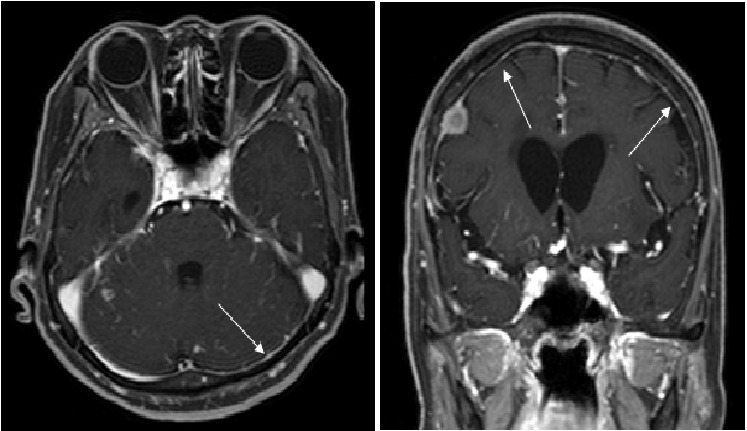 These atypical vessel lesions were observed in vessel wall CE MRI. Routine brain MRI & MRA are valuable tools in early diagnosis and for assessment of vascular involvement in TBM. However, high-resolution vessel wall contrast images as a noninvasive diagnostic technique demonstrate affected vessel wall thickening, enhancement and lumen narrowing’s in more detail. Correlation of vessel wall imaging with clinical manifestation and laboratory test results help establish the diagnosis of vasculitis and inflammatory nodule leading to multiple cerebral infarctions in TBM. 1. Lammie, G.A., Hewlett, R.H., Schoeman, J.F., et al. Tuberculous cerebrovascular disease: A review (2009) J Infect 59(3): 156-166. 2. Küker, W., Gaertner, S., Nägele, T., et al. 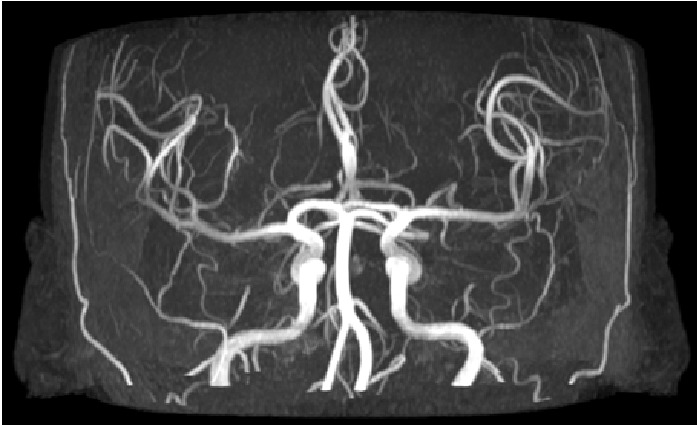 Vessel wall contrast enhancement: a diagnostic sign of cerebral vasculitis. (2008) Cerebrovasc Dis 26(1): 23-29. 3. Koh, S.B., Kim, B.J., Park, M.H., et al. Clinical and laboratory characteristics of cerebral infarction in tuberculous meningitis: a comparative study. (2007) J Clin Neurosci 14(11): 1073-1077. 4. Chan, K.H., Cheung, R.T., Lee, R., et al. Cerebral infarcts complicating tuberculous meningitis. (2005) Cerebrovasc Dis 19(6):391-395. 5. Anuradha, H.K., Garg, R.K., Agarwal, A., et al. Predictors of stroke in patients of tuberculosis meningitis and its effect on the outcome. (2010) Q J M 103(9):671-678. 6. Misra, U.K., Kalita, J., Maurya, P.K. Stroke in tuberculous meningitis. (2011) J Neuro Sci 303(1-2):22-30. 7. Hektoen, L. The vascular changes in tuberculous meningitis especially in tuberculous endarteritis. (1896) J Exp Med 1(1): 112-163. 8. Hsieh, F.Y., Chia, L.G., Shen, W.C. Location of cerebral infarctions in tuberculous meningitis. (1992) Neuroradiology 34(3):197-199. 9. Bernaerts, A., Vanhoenacker, F.M., Parizel, P.M., et al. Tuberculosis of the central nervous system: overview of neuroradiological findings. (2003) Eur Radiol 13(8):1876-1890. 10. Lee, S.I., Park, J.H., Kim, J.H. Paradoxical progression of intracranial tuberculomas and anterior cerebral artery infarction. (2008) Neurology 71(1):68.